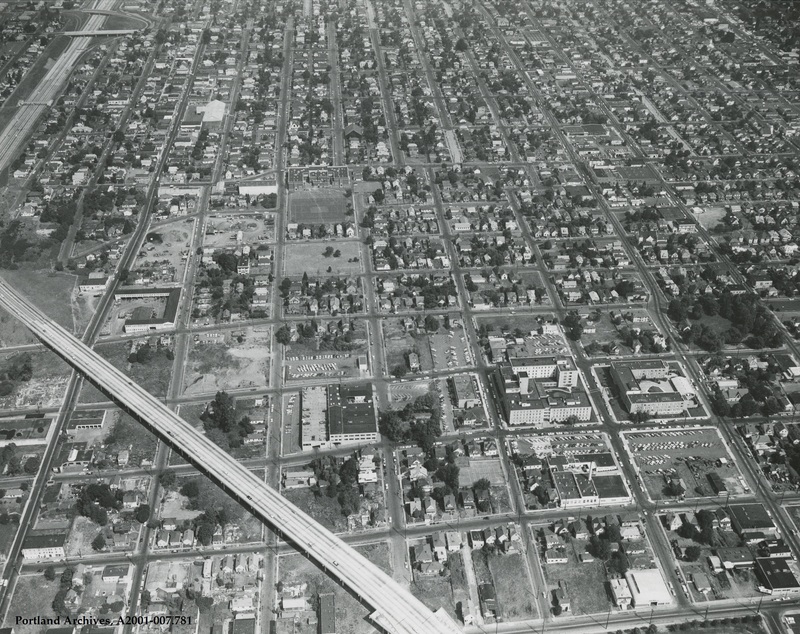 Aerial view of the Eliot and Boise neighborhoods, 1965. Boise-Eliot Elementary School and Emanuel Hospital are visible. City of Portland (OR) Archives, A2001-007.781. You can see the the on and off ramp stubs for the Fremont Bridge ramps there on the lower left in the photo. Fremont bridge wouldn’t be built till 7 years later. Fascinating to do a then and now comparison, especially around Emanuel Hospital and the Fremont Bridge onramps. I can see the Wonder Bread bakery at N Vancouver & Fremont. It’s interesting to see all the houses from before the freeways! In the upper left corner of the picture is the I-5 off ramp to Swan Island and Interstate Ave. I also believe that Roosevelt High School is also visable in the upper center.